Baby, it’s cold outside! It’s amazing how quickly you become accustomed to a new environment. Since moving to Atlanta, I’ve grown (or perhaps I should say, shed to) a thinner skin. Not long ago, 50 degrees F was considered cool, but tolerable. These days, I find 50 degrees to be a temperature warranting a bump up in the thermostat and a few extra blankets on the bed. Tomorrow is going to be a low of 13 degrees! I don’t care where you live, 13 is pretty damn cold! Throw in the windy conditions that are supposed to accompany those low temps, and I’m going into hibernation mode – see you guys in spring! If there is anything that can get me out from under my super cozy, down comforter tomorrow… it’s a bowl of this Wonton Soup. 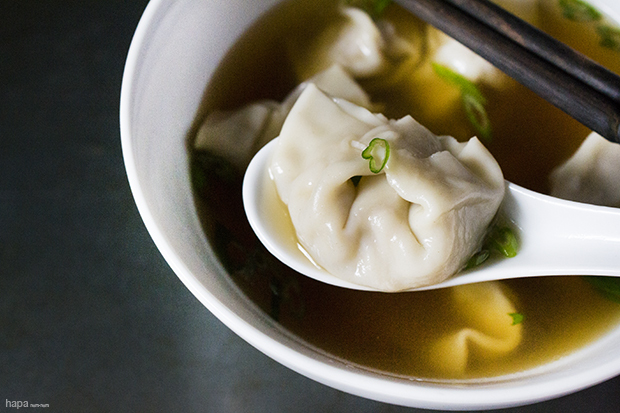 Hearty little wontons filled with flavorful pork, in a steaming bowl of rich broth – this is a bowl that will warm your entire body. And maybe, just maybe… you’ll forget how cold it is outside. In a large sauce pan, add the chicken broth, soy sauce, 1 teaspoon sesame oil, and ginger. Bring the contents to a boil and then cover and simmer for 10 minutes. Turn off the heat and set aside. In a medium bowl, combine the white parts of the scallions, ginger, garlic, ¼ teaspoon sesame oil, fish sauce, cornstarch, black pepper, and pork. Mix well with your hands until all ingredients are incorporated. Bring a large pot of unsalted water to a boil. Cover the stack of wonton wrappers with a damp paper towel and prepare a small bowl of water for sealing the wrappers. Working with one wrapper at a time, place 1 level teaspoon of pork filling in the center. Dip a finger in the water and lightly wet the edges of the wrapper. Fold in-half and slightly flatten out the filling. Fold over again forming a narrow rectangle (it doesn't have to be exactly in-half if the filling doesn't allow for it). Then bring the top corners of the ends together, wet the corners, and press to seal. (See the above images). As you're making the wontons, make sure to cover the completed ones with a damp paper towel, so they don't dry out. If your pot of water is at a rolling boil, turn it down to a simmer. (You don't want the agitation of the bubbles to break open the wontons). When all of the wontons are completed, carefully add them to the pot of water and cook for 6 minutes. While the wontons are cooking, remove the sliced ginger from the broth and reheat. Prepare your bowls for serving. Using a slotted spoon or spider, remove the wontons and divided them evenly among the bowls. Pour the broth over top and garnish with remaining green sliced scallions. Serve immediately and enjoy! 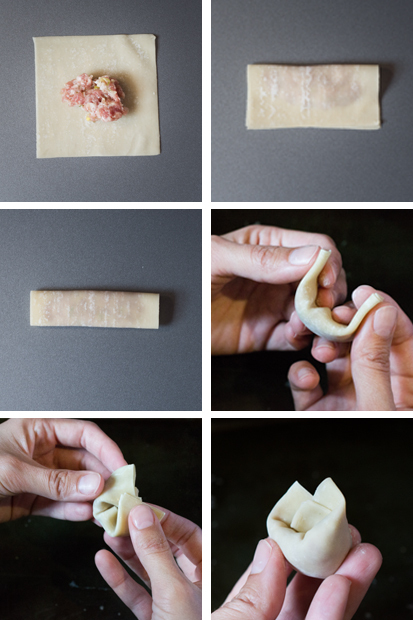 If you're looking for an easier way to wrap your wontons - place the filling in the center, wet the edges, fold into a triangle, and then take the two bottom corners of the triangle and pinch to seal. If you have leftover wonton wrappers, I love making wonton crisps. Simply heat ½ inch of vegetable or corn oil in a pan and cut the wonton squares into strips. To see if your oil is hot enough, try one test strip - if it bubbles up right away, the oil is ready. Working in batches, fry the wonton strips. Cook until light brown (less than a minute) and remove with a spider or slotted spoon. Allow to drain on a plate lined with a paper towel. Serve with the soup. If I didn’t eat pork (I do, but members of my family don’t), would ground turkey or chicken work just as well? Also, do you know how I would go about adding shrimp to each wonton? That may have been a not so brilliant question, but I’ve had some great wonton soup with pork and a piece of shrimp in the wonton. Hi Melanie! Sorry for the late reply; I’ve been traveling. Yes, you can certainly use ground turkey or chicken! And omg, yes – pork and shrimp are a delicious combo! I would just chop up uncooked shrimp, add it to mix, and cook as usual. Hi Kathleen: If I want to make this as a starter for a Chinese meal how can I prevent the won tons from getting mushy. Can I cook them and leave in the broth and reheat at supper time without overcooking the won tons? There will be so many last minute things to do for the menu for 8 people that I want to make….. and there is only me….. no sous chefs for assistance haha! I want to make Beef and Broccoli stir fry in a wok…. last minute thing, sauteed Chinese long green beans…..last minute thing, crock pot Sweet and Sour Orange pork instead of chicken, green onion pancakes… I can make in advance, coconut rice. Let me know if I can make the soup the day before and leave the won tons in the broth until suppertime the next day and reheat then or if I should remove the won tons from the broth, wrap them in saran wrap and put in the fridge and reheat them in the broth at supper time. Wow! That sounds like an amazing menu, Maureen! If you didn’t live all the way in Toronto, I might be knocking on your door 😉 So you don’t want to cook the wontons ahead of time – even if you pluck them out, they will just get too soggy when they go back into the pot. 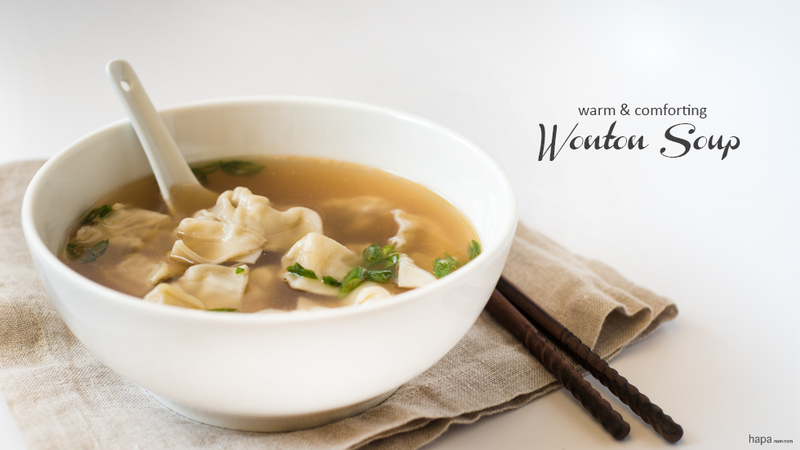 However, wontons actually freeze very well – up to 2 months. Simply lay out the stuffed/folded wontons (uncooked) on a baking sheet lined with parchment paper and freeze. Once they’re frozen, transfer them to a zip-top bag. When you’re ready to use them, just reheat your broth to a gentle simmer, drop them in, and cook for 6 – 8 minutes. That’s it! I’m so glad you enjoy the blog and thanks so much for the question! I hope you and your guests have a wonderful supper – it sounds like it’s going to be incredible! LOVE this recipe! Just made it for my mom’s birthday yesterday- it was such a hit. I had more time, so I boiled down 12 oz of broth down to ~8 oz for a little extra depth. Thank you so much for sharing your talents! I’m always interested to see how people make their wontons. This is a fabulous classic recipe. And your ingredients list is SHORT which I love! Have you noticed that some wonton recipes have very long list of ingredients? I also like the classic soup base you’ve used. I usually make mine with chicken broth made from Chinese chicken stock powder, I am convinced it tastes more wonton-soupy (well, you know, Chinese soups rather than chicken noodle soup flavour!). Yes, I have noticed that some wonton recipes are a mile long! I wanted to make something with a manageable list that didn’t compromise on flavor – I think this recipe did the trick 🙂 I never tried adding Chinese chicken powder to the broth – that’s something I’ll definitely need to look into! Love wonton soup! Never made it from scratch before though.. what a delicious idea! Thanks, Thalia! Give it a try, it’s surprisingly easy to make! Living in Texas, I consider 50 degrees to be downright cold too. Temperatures have been in the 40’s this week, so soup has definitely been on the menu in our house. I will have to add this wonton soup to the rotation. This recipe reminds me of russian ‘pelmeni’! Hi Dimitar. This is great! Thank you so much for sharing this information! I’ve never heard of pelmeni, it has such an interesting history and cross-cultural development. This is something I definitely have to try! It’s one of my favorite soup, and yes, I need them all the time during winter! I love wonton soup and I love your beautiful photos here! Never tried homemade wonton soup, I always get it at restaurants. Great time to make some soup, too! The wontons are cute!!! Pinning! I didn’t start making my own wonton soup until recently, but I’m so glad I did! It takes far less time then I ever thought! This soup looks so good! Now I’m mad I got Chinese take-out last night…I just needed to wait a day! Thanks, Annie! I hope you enjoy! It’s one of my favs too. I hope this soup warms you up as much as it does for me!